AllCells’ cryopreserved cell products are delivered in dry ice to maintain the frozen state of the cell product. Upon arrival, check vial(s) for loose caps or any other physical defects. When handling or transferring frozen cell products, it is important to keep the vials completely frozen and to avoid transient warming events. Do not expose the vial to ambient temperature (20 – 25°C) for more than 5 minutes. Transient warming events may affect cell viability and/or function after thawing. For short-term storage (≤ 30 days), cryopreserved products may be stored at – 80°C until use. For long-term storage (> 30 days), products should be stored in vapor phase of a liquid nitrogen storage tank. We recommend using our Thawing protocol (web link) to properly thaw and wash the cryopreserved cell product prior to your downstream application and use. Cryopreserved products should be counted immediately after thawing before any further manipulation. AllCells is not liable for any cell loss during subsequent processing or manipulation. WARNING: Do not store AllCells frozen cell products in the liquid phase of liquid nitrogen (LN2). Liquid can enter closed screw top cryovials, which then have the potential to explode when removed from storage. If AllCells products are stored in liquid phase of LN2, at -20°C, or -80°C for >1 month will void any warranty of the product. Laboratory personnel should use extreme caution when storing samples in LN2. LN2 storage consists of a liquid phase and a gaseous. If cryovials are immersed in the liquid phase, LN2 can enter the closed screw-top cryovials during storage. The cryovial may then explode when it is removed from storage due to the vaporization and expansion (700x expansion ratio) of the liquid nitrogen inside the cryovial. Frozen cells should be kept on dry ice until ready for thawing. Recommended media for diluting and washing cells are RPMI 1640, IMDM, or DMEM supplemented with 10% heat inactivated FBS warmed to room temperature (20-25°C). Proper aseptic technique should be used when handling and manipulating cells. Check that the vial is tightly capped and place in a 37oC water bath. After 90 seconds (1.2mL vial fill) or 2 minutes (1.8mL vial fill) at 37°C, remove the vial from the water bath every 15-20 seconds and gently invert 3-4 times to check the level of thawing. When the vial contents are 50-75% liquid, remove from the water bath and continue to gently invert the vial until the entire contents are liquid. Place the vial on wet ice and transport to a biosafety cabinet. Wipe the outside of the vial with an alcohol wipe and gently invert 5 times to mix the cells. Check to see if there is liquid caught up in the cap. If yes, gently tap the upright vial on a benchtop to force the liquid into the vial. Immediately remove 20μL of the contents for cell concentration and viability determination. Keep the sample on ice until assayed. Transfer the remaining vial contents to a 15mL tube at RT (20-25oC). Add 1mL of media to rinse the vial and transfer any remaining cells to the 15mL tube. Slowly add 10mL media (about 1mL per second) to the cells. Securely cap the tube and gently invert 3- 5 times after adding all the media. Centrifuge the tube at 200g x 8 minutes at RT(20-25oC). Aspirate the supernatant without disturbing the pellet and resuspend the cells in 12mL media. Centrifuge the tube at 200g x 8 minutes at desired temperature and resuspend in an appropriate volume of media for your downstream application. We recommend that you determine the cell concentration and viability of the washed cells prior to using the cells in your downstream application. Liquid nitrogen has a 700x expansion ratio, which may cause physical hazards and injuries from the explosion of cryovials, containers, equipment, or other devices. Extensive tissue damage or burns can result from exposure to LN2 or cold nitrogen vapors. Asphyxiation may result from the displacement of oxygen in the air with nitrogen to levels where there is insufficient oxygen. Inhalation of oxygen deficient air can cause dizziness, nausea, vomiting, loss of consciousness, and death. Hands should be protected with waterproof thermal insulated gloves that can be quickly removed if LN2 is spilled on them. Cryo gloves are not intended for submerging hands into LN2. Body must be protected with pants, lab coats, and closed-toe shoes. Eyes are sensitive to the extreme cold of LN2 and its vapors. Over-pressurization may result in the explosion of improperly stored cryovials. Chemical splash goggles should be used when handling LN2 and when handling cryovials and other sealed containers that have been stored in LN2. AllCells uses cryovials that are designed for vapor phase liquid nitrogen storage. If long-term storage in the LN2 liquid phase is required, do not use the cryovials provided by AllCells. Manufacturer-approved cryovials, specifically designed for liquid phase storage. Gaseous phase-approved screw-top cryovials that are then hermetically sealed in an outer protective envelope designed for use in LN2. The handling of cryovials inside of Biological Safety Cabinets or Chemical Hoods (with the sash lowered) will further reduce the risk of injury from explosions caused by excess pressure within the vial. Limited Warranty: AllCells warranty of frozen cell products for a period of 1 year form the date of receipt if stored properly. The products purchased from AllCells, LLC are “For Research Use Only.” In compliance with U.S. Food and Drug Administration (FDA) Regulations, these products are not intended for use in clinical diagnostic procedures nor in therapeutic procedures. Treated as potentially contaminated biological specimens even if available serological reports are negative. Handled by establishing or following appropriate safety control procedures to ensure the safety of using these products. 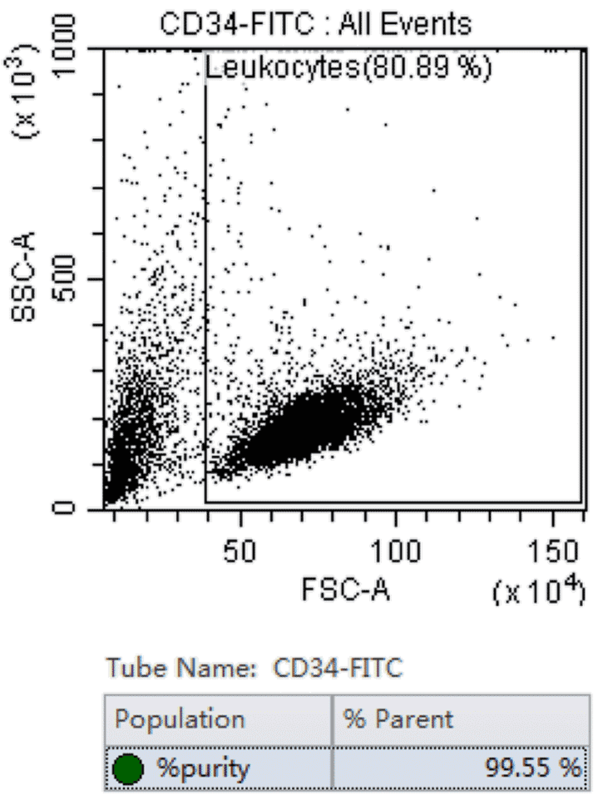 The figure below is a sample Flow Cytometric Analysis of our CD34+ enriched stem and progenitor cells from human mobilized peripheral blood. The upper left panel shows the leukocyte gating that removes the RBCs and debris from the purity analysis. 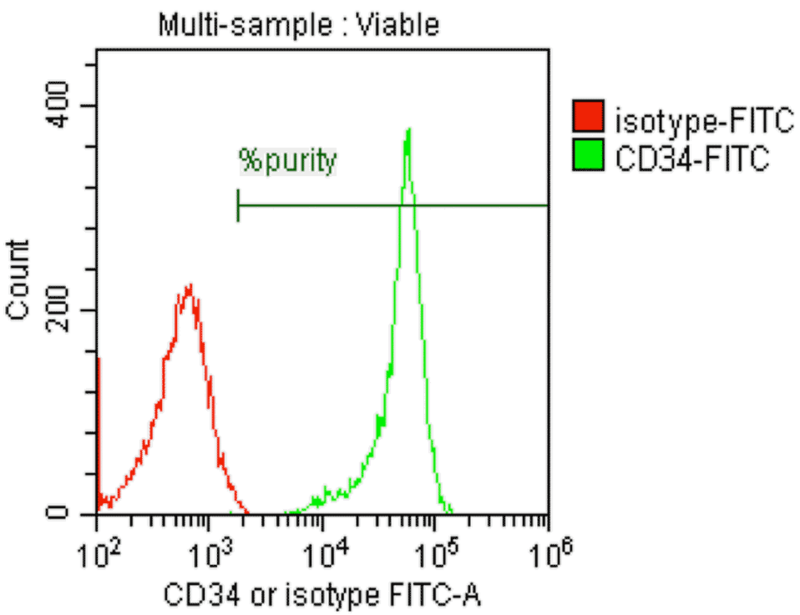 The upper right panel shows the purity of cells as well as the isotype control reagent used to determine the background level of staining to set the positive gate. The bottom table displays the percent purity of the analyzed sample. Samples were analyzed on a BD FACSCantoTM or Beckman Coulter CytoFlexTM.